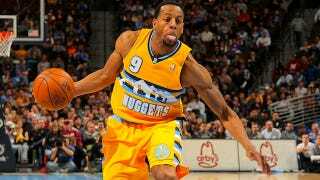 GQ just posted an interview with Nuggets guard Andre Iguodala that includes a few entertaining insights. Iguodala talks about the "chill" spot he retreats to for hours at a time where he can "watch SportsCenter and text people and just relax," and he also tells us that Deadspin favorite JaVale McGee is a nerd who likes to play with gadgets. But the best part of the interview comes when Iggy is asked for his opinion on clubs. I think it's just once you've seen one you've seen it all. With the exception of maybe Vegas or Miami once or twice, other than that it's all the same to me. I can't hear anything in the club with the loud music, so you're in there and you're like, "I CAN'T HEAR YOU BECAUSE OF THE LOUD MUSIC." I hate that, yelling back and forth. And I don't drink, so it's kind of pointless. It's funny because it's true, you know? He's just saying what we're all thinking, am I right?